Thermostats have always been difficult to work with, as most people will, probably, tell you. They are usually hard to program, requiring the user to press an endless number of arrows for their preferred temperature selection. Once it was selected, for a specific period of time, absolutely no adjustments are possible without going through the entire process all over again and ruining the programming. 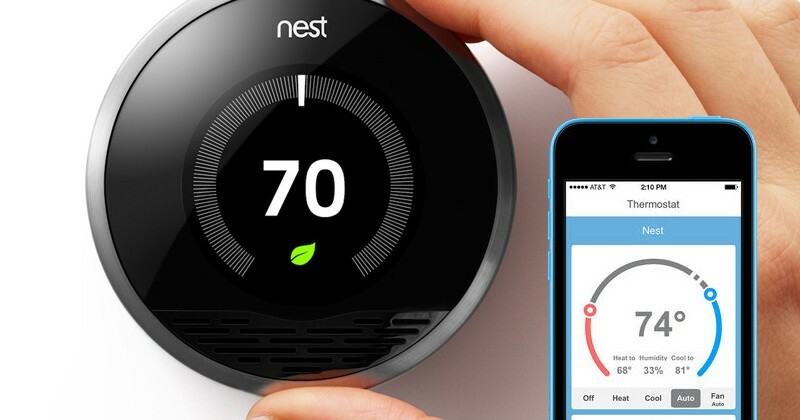 However, all that changed when Nest labs introduced to the world their programmable thermostat. The Nest Thermostat quickly won everybody’s hearts as a tool that is simple to use and definitely an improvement when it’s considered vs. the old solutions. The first key selling point of this ultimate generation gadget is the fact that it’s not just a thermostat, but a device that was originally the brainchild of two Apple engineers, Tony Fadell and Matt Rogers. Therefore, when they got on board, in 2010, and decided that all the other thermostats on the market were inadequate, the outcome was bound to be good. As expected, the gadget saw huge success and was later on, in 2014, purchased by Google, along with the entire Nest Company. In the same year, the Nest thermostat became available in Canada and European countries as well, such as Belgium, Ireland, France, the UK, and the Netherlands, making the device a world-wide trend. Not everybody was pleased, though, when Google decided to purchase Nest and continue manufacturing the Nest thermostat themselves. There were voices that actually accused the giant corporation of using the smart thermostat in its never ending campaign of personal data collection. There was a German activist group, called Peng Collective, which, in 2014, initiated a parody website called Google Nest, which they used as a satire against Google, “releasing” fake products that imitated the Google ones, such as Google Trust, Google Hug, Google Bee, and Google Bye. Needless to say, the very next day lawyers representing Google issued a cease-and-desist letter to Peng. Before you run out and buy the smart thermostat, there are certain features it has, regarding both hardware and software, which you must be aware of, seeing as it’s a smart device. Here they are. 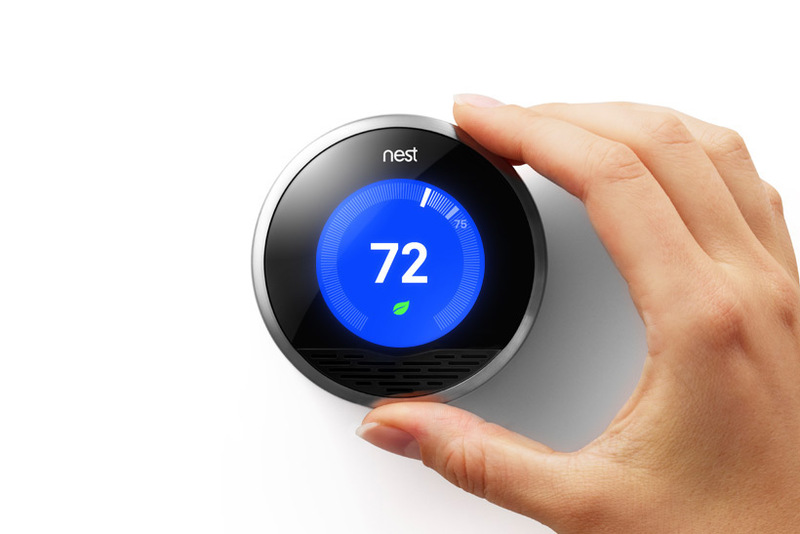 Hardware details – as far as compatibility goes, the Nest thermostat does have a wide wireless compatibility network, comprising most standard HVAC systems which use central heating or cooling pumps. With regards to the thermostat controlling them, it uses standard connections. The device has two main pieces of hardware: the display, which holds the circuit board and the rotating ring and the base, which contains the connection terminals, the bubble level, and the holes that one uses to anchor it to the wall. Neither one of these hardware pieces can function without the other, so it’s a good idea not to disassemble the device. Also, the Nest thermostat is coupled with a “Heat Link” piece that holds all the circuits needed to control the main voltage heating system. 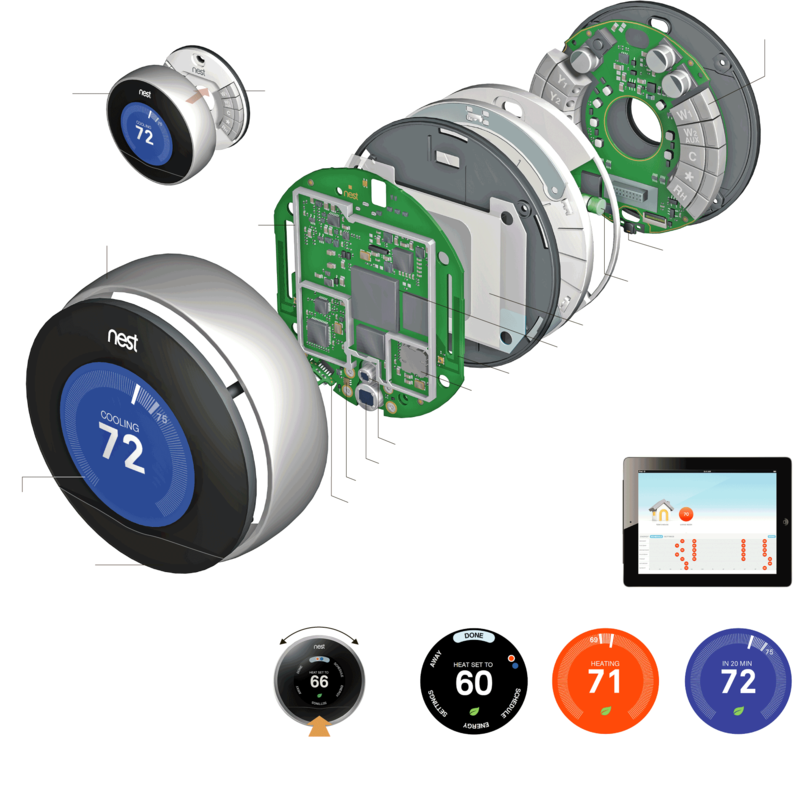 For people living in Europe, Nest sells a special edition of the thermostat there, which can control heating systems between 120 and 240 V.
Software details – The Nest thermostat is equipped with a piece of software that is mainly controlled by spinning and clicking the control wheel. This motion brings up option menus that allow you to switch from heating to cooling, to access the settings, their history, and the scheduling made. You can also control it with a touch screen. Apart from that, given that the gadget is linked to the Internet, the producers can use this path to introduce updates or additional features and fix bugs remotely. But, for that, the thermostat needs to be connected to your Wi-Fi network permanently and its battery has to have at least 3.7 V. This is the minimum power required so that the thermostat can download and install the necessary updates or any app it might require. And it has had quite a few so far. For the tech aficionados who really want to go in depth with their thermostat, you should know that it’s based on the Linux 2.6 37 version, which means it’s open to free updates. the thermostat’s amazing ability to learn. Users have delightedly reported that the appliance actually remembers your settings after you’ve done them a couple of times. So, let’s say that you wake up in the morning and go to the thermostat to crank up the heat, so that you warm up the house. After a few days of doing it, the Nest will remember your choice and do it for you. the possibility of controlling it using your phone. Another great feature as far as software goes, you can actually change the temperature from your phone, as long as you’re in the house. It doesn’t even matter if it’s Android or iOS. adding a PIN to the device so that you can lock down a certain temperature, in order for others not to be able to change it. This is great for making sure children don’t get around to toying with the device. 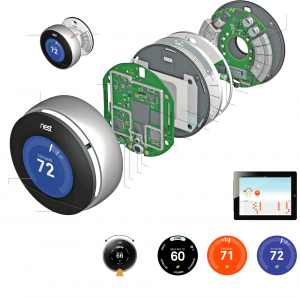 Before you will actually receive your own unit and start installing it, the people at Nest will advise you to use a compatibility widget you can find on their website. It’s actually a series of multiple questions you have to answer, in order to make sure your current heating system won’t experience any problems while you install the Nest. After you’ve completed this step, as far as the actual manual installation goes, you can either install it yourself or call a professional for help, which the website will gladly assist you with as well. It will immediately locate those nearest to you and provide their contact details. But, if you want to install it on your own, you have to shut off power to the furnace and strip four wires (in average, because your mileage could vary), insert them in the holes in the base and then screw the base very tightly to the wall. Use the base’s level, which is built in, to make sure you got it on straight. A great thing when it comes to installation is that, if you don’t have any tools around the house, you needn’t worry, as the Nest thermostat comes with a small, but very reliable screwdriver, which is worth its money. The next steps are to plug it in and power it up, as far as hardware goes. For the software part, you need to setup your Nest account, which means entering your WiFi info and some details about your home, which your device will provide, if you don’t know them. After that, simply wait for it to learn your house’s particularities, which it will do in a matter of days. Being such a widespread device nowadays, as well as a real pioneer in its niche, the Nest has received many reviews in the past couple of years. You can find them in magazines or on dedicated websites, if you’re looking for a specialized opinion. If you’re more interested in actual user’s opinions, you can find commentaries and home-made reviews mostly on the sites that sell the gadget, such as Ebay, Home Depot, Lowes, Amazon, or the Nest site itself. Also, this is the place where you can buy the thermostat and work on your savings as well. As far as buying is concerned, the resellers have it up all year round, they provide discounts, allow you to use coupons, put them on sale in certain periods, and organize Black Friday. If you were wondering how much money you need to spend, the price differs from store to store and it depends on the generation you want to buy. The Nest thermostat has had three generations so far, all with a different cost range: the 1st generation appeared in 2011, it’s smaller and has a thicker profile, the 2nd generation was launched in 2012, and the 3rd generation in 2015. 2nd and the 3rd are superior to the first, as far as both hardware and software go. it comes with excellent software support. it cannot control hot water. All in all, the Nest thermostat is a much loved and widely used device around the world. It literally changed the game and improved the way in which we set up the temperature in our homes, making it a lot easier to control and allowing us to save money on heating. Remember the times when you used to worry about leaving the stove, coffee machine, lights, or thermostat on? That is definitely a thing of the past, thanks to the amazing leaps smart home technology has made in the past decades. The improvements have transformed this idea from a bunch of difficult-to-use pieces of equipment to a very user-friendly network and set-up of devices, which will allow us to control everything house-related remotely, while making the space itself look like something the Jetsons would feel familiar in. A smart house is considered one that has a network which links together all the home appliances, for people to be able to control via phone, tablet, laptop, remote control, iPad, or voice. You give the command and the house reacts, without you having to actually flip a switch, touch a button, or even be there. Most apps on the market today in the smart homes realm refer to home security, lighting, thermostat regulations, and entertainment. The idea of a smart home design is not new at all. The very first remote controls were invented back in the late 1800s, right after electricity was introduced and technology began to speed up. This invited appliances into homes, after servants became sparse. Developments to early designs continued all through the 20th century, but mostly in the shape of private projects, which used to be showcased at specialized fairs. The systems were difficult to handle for a common person who didn’t have a working knowledge of electronics or informatics, and, apart from that investments in the business were low. The 1990s coined the term “domotics”, by putting together the Latin domus, which means house and informatics. Even so, the main public still didn’t take much interest in it, mostly because it cost so much to install it. However, the extreme advancement of technology, which, in a single 20 year span, took us from cassette answering machines to smartphones (developed in such a way that they pretty much make all other devices pointless), meant a revival of the smart home plan as well. Studies show that in 2013 alone, 1.5 million home automations were installed in the US and that, by 2017, as much as 8 million will be in use around the country. 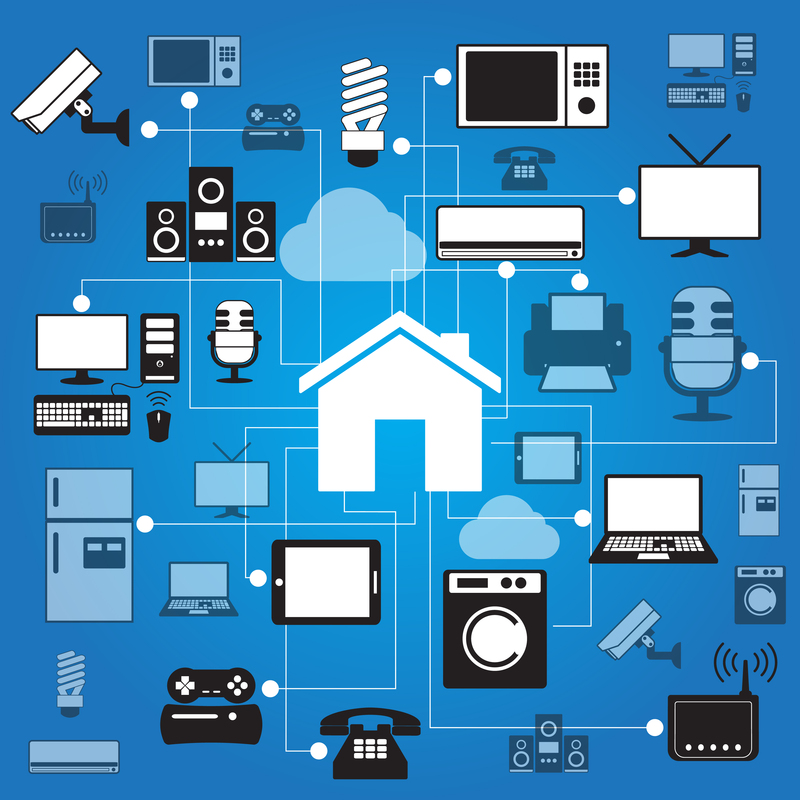 The idea of smart homes is growing so much and so fast that a new term was introduced – “the Internet of things”, which refers to all the objects and products connected via a network. Cameras, which are used for monitoring both the inside and outside of your house, even at nighttime and which you can control and watch remotely. Thermostats smart enough to be controlled and adjusted from anywhere, as long as your phone has a signal. LED lights, for which you can adjust the brightness and color from both inside your house, without actually touching them and from the outside, remotely. Motion sensors, to let you know when there’s movement around the house and which are able to tell the difference between strangers and pets in the house. Smart tech appliances, which can be turned on and off from wherever you are. Doors and smart locks, including inside the house and for the garage, which lock automatically once everyone has left the house and which open immediately as your smartphone approaches. Alarms that send messages to your phones so that you are immediately notified if there is a problem or a breach at home. All of these electronics, devices, and apps are available in stores or online for purchasing as well as at your local depot. However, before buying you should check and see what type of technology goes with what product. Normally, the ones using the same technology should go together even if they were made by different manufacturers. Different technologies, however, might mean that you have to create a ‘bridge’ between the appliances in order for them to work properly. Another thing you should be aware of when installing them or wiring your house for the smart technology is the fact that you will require help. This means that making your home ‘smart’ cannot be a DIY project. Studies show that 60 percent of the people that have installed a home automation system have hired outside help, because the systems themselves need a lot of patience and technical skills and knowledge from the installer. 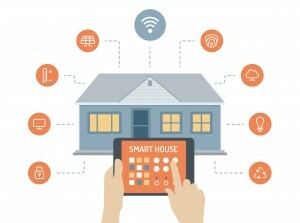 How Much Do Smart Home Systems Cost? As far as price goes, it depends on how smart you actually want it to be, because you can invest in it as much as you want and make it as smart as you want. Therefore, reviews show that prices range from $10,000 to $250,000. Starting low, a smart lighting system, depending on the producer, might only cost you a few hundred dollars. Going up and adding appliances, thermostats and smart cameras will take you to some tens of thousands of dollars. And, finally, what really make these systems pricy are the home entertainment, cinema, Blu-Ray, or theater elements. On average, they tend to raise the prices by 50 percent. Also, the cost is influenced by the level of sophistication that is brought to each appliance. For example, there are some appliances that have incredibly developed solutions, such as smart trash cans, that actually keep track of what you’ve thrown away, make groceries lists for replacements and send them to your phone, refrigerators that create recipes for you based on what you currently have in there or washing machines that text you when they finished their cycles. Evidently, these will cost more than, let’s say, trash cans that only let you know when it’s time to empty them. 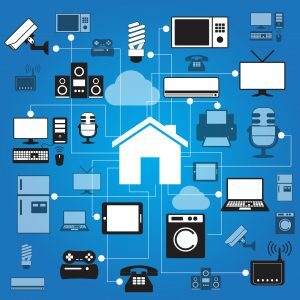 Although it might cost fairly much now, smart homes do have many benefits, part of which will also win back your investment over time. Saving a lot on electricity, because all the lights will automatically turn off when you leave a room or when you leave the house. Making life very easy for people living alone, people who are sick or for the elderly. Smart homes can notify them when it’s time to eat, sleep, wake up, take their medicine, honor their doctor’s appointments, turn off the water so that it doesn’t overflow and the oven when it has been left on. If all this seems quite extraordinary, it’s actually nothing compared to what the future has in store for us as far as smart homes ideas are considered. Specialists are starting to predict that, in the future, smart homes will be able to differentiate between family members, talk to them and adapt to each one according to their fingerprints, body temperature, and the rhythm of the heart. This means that the house will know what your needs are and give you what you require without you even uttering a word. In the future, as you walk around the house and you’re wearing a small bracelet that controls everything, including the furniture, your house will know to adjust the lighting in each room, the temperature, and play your favorite music. The kitchen will provide what you need by heating up your food as you like it, making your favorite coffee, and the entertainment center will automatically display your favorite movie selection. The prices for both electronics and the service will go down and many of the items will be found on sale. Smart homes are definitely here to stay. We’ve seen them in movies, such as Back to the Future and Iron Man and we’ve always admired the technology and ease with which one lives in such a house. 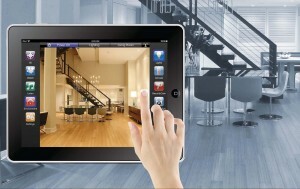 Now, as technology progresses more and more, it seems as though smart homes are one smartphone touch away. Deep in the middle of the winter season, we often find that our pipes need insulation, in order to keep them from freezing. The reason is obvious – if they freeze over, that means the water in them will freeze as well, and you’re all of a sudden cut off from your water supply. The easiest solution to fix that is by fitting some heating tape or heating cable on them, so that you ensure a continuous water flow for your residence all through the freezing season. An easy definition or explanation of the device is that it’s simply a piece of tape or cable with some encased electrical wires which, when you plug it in, will regulate the temperature of your PVC, plastic or metal pipes, so that they don’t freeze over. Many people often confuse heating tape and heating cable, believing they are one and the same thing, but they are mistaken. Normally, if you’re thinking about installing this device around your piping, you should know the difference between the two, so that you can make an informed and correct decision about which solution suits you best. There’s actually even a third type, the heating cord, but that one is less used than the first two. Heating cable is somewhat stiff, more like a garden hose than a cable per se, but it’s very good if you wish to wrap it around your pipes and it does not shrink; Heating tape if extremely flexible, therefore it’s better for tight contours and oddly shaped pipes; The heating chord is just as flexible as the tape, only that it allows you to be imprecise when wrapping. 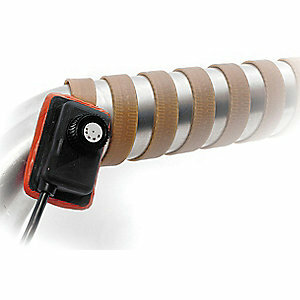 As far as length goes, heating cable can be cut to length and you can also add terminations to it; the tape comes in fixed lengths, somewhere between 2 and 20 feet, based on its style and you should know that it cannot be cut or trimmed if you don’t have the right length; the heating chord has the main advantage of being built to order, but it can also be sold in fixed lengths, anywhere between 3 and 24 feet. Unlike the other two types, heating cable is thusly built so that it won’t rise above a particular temperature. This is an advantage, because it means it will not overheat. Then again, bear in mind that you will still need a controller to regulate the temperature, like the simplest thermostat you can find. For the other two you will need controllers as well, but the main difference is the fact that they do overheat, because, unlike the cable, they do not come encased in anything. Another main difference is about the way they must be wrapped around pipes. Of all the three types, the one you need to be most careful about is the tape. It needs to be wrapped perfectly and tight around each pipe. The reason is that if there is even a small segment of tape with both sides exposed to the air, that particular segment will not transfer heat beyond that point and the tape will overheat and break down. The chord and cable are a lot more forgiving when it comes to wrapping. You should also know that there is heat reflective tape on the market, which is not to be confused with heating tape. The heat reflective type comes in silver or gold and is mainly used by race car drivers to fix their heat soaking problem. People also confuse it with duct tape and often wonder about what the duct tape’s resistance to heat is. While some types of duct tape and even the double one can take more or less heat, they won’t protect your pipes against frost. Heating tape is electrical and heats itself. Silicone rubber heat tapes – mostly used for applications up to 450°F, they resist to chemicals and to moisture. However, it’s important to note that this doesn’t mean they are completely chemical and water-proof. They cannot be exposed to flowing water or be submersed. If you want, you can purchase this particular type of tape with an adjustable thermostat, so that you can keep the temperature under control. You can also buy a grounded version of it for applications up to 305°F. Fiberglass-insulated heat tapes – this particular type doesn’t come with a built in thermostat, like the first one, but it does have a controller. You can purchase the grounded version of it, which you can use for applications to 482°F, the version which is meant solely for electrically non-conductive surfaces and the one that can be used for conductive surfaces. The last two can both be used for temperatures up to 900°F. Heat tapes made of Samox – this is a woven type of fabric, resistant to very high temperatures up to 1400°F and it can be purchased in two versions: for electrical and non-electrical conductive surfaces. Frostex heat tape – which also has a 3 watt per foot electric heat trace cable and which is best for mobile homes, because their water lines connect under the house, where the air is very cold and damp. 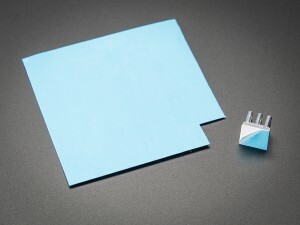 Heat sink thermal tape – especially made for attaching heat sinks to ICs, through the 3M thermal tape. It’s self-adhesive and it will bond better than glue or paste. The first thing you have to do is to remove the old one. This might sound like an obvious step, but it’s important, because most people try to salvage the old heat tape or parts of it, which is not advisable. This is the type of equipment that should be thrown out when it’s broken, as it cannot be fixed and it’s dangerous to try to reuse it. A heating tape’s life span is between 3 and 5 years. The second step is to fasten it to the water line. The best thing here is to simply follow the instructions that came with it. Make sure not to fasten it too tight. Also, the heat tape should never turn any sharp corners because a sharp bend is almost always going to make it fail in its purpose of heating the pipes. The solution is to just give it some room, when you reach the corner of the pipe, so that it doesn’t have to take a sharp turn. Don’t pull it on the pipe too tight, because you might pinch it. Know that a heat tape for pipes which has an inbuilt thermostat usually takes between 5 and 20 minutes to heat up. Also, those that come with a thermostat are usually labeled “automatic”. You can also use solar power to activate it and use it for regulating the pipe temperature. You will still need for the installation to be thermostatically managed, though. 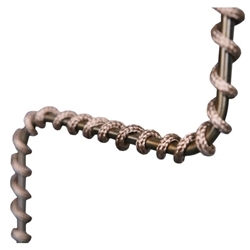 Some good and trustworthy brands to buy it from are Reptile Basics, which also sell the FlexWatt heat tape and the Teflon kind, Lowes, Menards and Raychem, where you can also buy it on sale. Here is all you need to know about how to install, use and maintain a pipe heat tape. It is a very good solution to making sure your pipes don’t freeze over and, thusly, you never run out of water, but you need to remember to be careful with it, as it’s a piece of electrical equipment, designed for the outdoors and to be used near water and moisture. Insulating your home, building or office for the winter is a very good idea, for a variety of reasons. The first one would be reducing costs as far as heating, gas and electricity bills go. Comfort is also important, as through insulation we’re trying to keep our homes as warm as possible. And last but not least, we’re always trying to be as eco-friendly as possible. The less energy we consume, the greener we are. 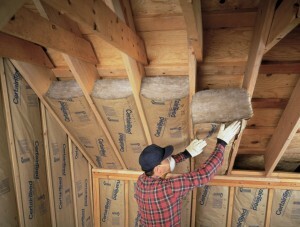 But insulating our homes may not be as easy as it appears at first glance. There are some rules and regulations to comply with, because insulation needs to be done after a certain general standard, imposed by the law. Here is your 101 on how to comply with the building code enforcement this winter. All building regulations serve under the International Building Code, a model building code which was developed by the IIC or International Code Council and has been adopted by most of the states in the US. The European Union has its own code, called the Eurocode, as does Canada with the National Canadian Building Code. In the US, the organizations that adopt model building codes statewide are the state governments, counties, fire districts and municipalities. Some private sector model codes do exist. They are funded by the federal government and used by the Department of Defense, the National Park Service, the Department of State and the Forest Service. This is due to the fact that their buildings have special features. History has shown that a model building code has a medium life span of 3 to 5 years, after which it should be updated. So, you have don’t a code in 2009, 2010, 2011 and so on, but rather a 2006 edition, a 2009 one and another in 2012. The stress here is on updating the existent code. Because organizations don’t come up with a whole new building code every 3 or 5 years, but, rather, bring forward new and improved versions of the current one. Also, an important thing to mention is the fact that the new versions are not automatically adopted. This means that when the new variant comes out, some states or jurisdictions or a certain county might choose not to adopt it, but rather to continue running on the old one. The reason why this happens is because, normally, it takes a lot of time to adopt a new model. It must be voted upon, the officials or congress need to sign it and all the inspectors must receive training on it. An exam can be taken and reports are made. This is very important for you to know, so it might be a good idea to inquire exactly which version your state or city is using when deciding to insulate your home. Means of egress – they refer to the escaping routes accessibility, especially in case of an emergency, such as a fire, earthquake or terrorist attack. Seismic prevention is taken very seriously. You can also find the building code online, in PDF or E-laws format, available for free download. Although, as mentioned above, most of the states have adopted the uniform International Code, there were some that have had problems with it. The most famous case is California. Their National Fire Association division or NFPA, joined the ICC at first to create an universal code. But misunderstandings lead to the NFPA’s withdrawal from the project and teaming up with International Association of Plumbing and Mechanical Officials (IAPMO), the American Society of Heating, Refrigerating and Air-Conditioning Engineers (ASHRAE) and the Western Fire Chiefs Association to create their own codes. In 2002 they published the Comprehensive Consensus Codes, which includes the famous NFPA 5000 that California quickly adopted. Although it was dropped when Governor Schwarzenegger was elected, it still caused disparity between California and other states, such as Florida, New York and Michigan. First of all, one thing you should know about is the R-value, because this is the most common term you will come across while researching or reading about insulation. The R-value is a measure of thermal resistance for a particular material, where R means how thick the material normalized is to thermal conductivity. The US Department of Energy has been recommending in the past years R-30 and R-38 ceiling insulation, but you can go higher and still comply with the code. As a matter of fact, since we always want our homes to be as efficient in keeping out the cold as possible, architects and builders use a promo R-50 up to R-60 insulation. However, violations do happen. Of course, the level depends on the local temperatures and the climate zone you live in. Also, you should always keep in mind that there actually is such a thing as ‘too much’ insulation. Simply because, at some point, it becomes moot. And, if you keep on adding a mass of layers you will just be spending your money and getting no extra results. You can always get a certification, to be sure you put enough in. Also, while discussing money you can find commercial coupons online that can get you up to 40 per cent off the original price. Use the ZIP code insulation calculator to determine how much insulation you actually need for the area you live in, in order to comply with the building code. You can find it on the Department of Energy’s website and you can also use the R-Value Recommendations Calculator, although it has fewer options. Your total window area must be equal to or less than 30 per cent of the total exterior wall area. The combined window area of your east, south and west walls must be equal to or less than 30 per cent of the combined perimeter of these walls. Your skylight area, in total, must not be more than 1.2 square meters. Your total leadlight glass area must not be more than 2.6 square meters. If you are planning on putting in downlights that are not CA rated, they will reduce the total thermal resistance of your ceiling. 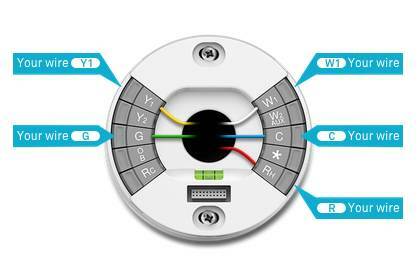 Therefore, the code states that you need to increase the R-value so that it can compensate for the downlights. (CA rated means ‘closed-abutted’ – in this case, ceiling lights that have insulation to their sides or not). When you calculate the R-value of your heated floors, you should not include the R-value of carpets or any other floor coverings, in section. If you are planning on having heated walls and/or ceiling, you should know that higher R-values are required by the building code. This means that walls need to be R 2.6 and ceilings R 3.5. All your plumbing should be isolated. The deck, stairs, railings or hand rails should not be included when calculating the R-value. Your basement should be isolated as well. Make sure your garage is not drafty and losing heat. Replacing old appliances with new models, which are more evolved technologically speaking and benefit from a special design for consuming less energy. They can use up to 40 per cent less energy than older models and lower the electrical bill. Replacing some appliances with manual solutions, where possible. For example, using the dishwasher less and washing more dishes by hand or installing an old-fashion clothes line, so that you use less of the clothes drier. Using nature as an ally. For example, planting trees, both leafy and evergreen near your house, so that they can act as a barrier and provide shade in summer, which means you’ll be using less of your air conditioner and protecting the house from wind and snow storms in the winter, which means less heating. Painting your roof in light colors. Dark roofs can become overheated in summer as dark colors attract sunlight by definition. The simplest solution here, in order to keep your roof and, therefore, your house cooler during hot summers is to paint the roof in light colors. Hurricane regulations need to be followed as well, even if in basics. The rules, regulations and requirements of the building code regarding insulation are not difficult as far as code compliance goes, even if we are talking about the situation where you build a new house or insulate an existing one. All you have to do is make sure you do your homework before you start planning and designing. You probably already know how important clean and fresh air is. But do you know how important air circulation inside the house is? Every year we seem to be adding more and more padding to our houses, in an attempt to insulate them against the cold. This we do, of course, in order to lower our heating and electricity bills, but over-insulating the house also means it becomes air tight. Thusly, air will not able to circulate well enough or at all between the inside and outside of the house. Stale air can lead to health problems such as asthma and allergies but, fortunately, there is a simple solution – ventilators. They are especially important in bathrooms and kitchens where moisture and humidity levels are very high and accumulate quickly. 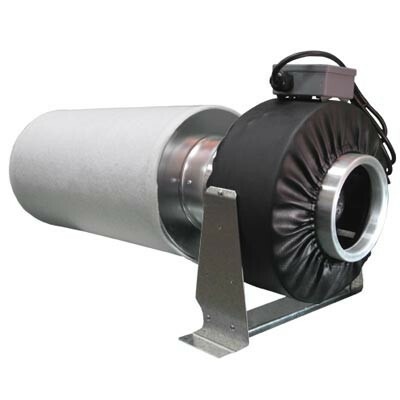 A very efficient, healthy and flexible option when it comes to ventilation is inline blowers. They exhaust all the moisture, steam and bad odors and keep your house healthy and aerated. Here is a guide to in line blowers, complete with all the questions you always wanted answered about them. What is an inline blower? It’s basically a big fan, located inside your ventilations systems, normally in your kitchen or in your bathroom. When inside the kitchen it’s usually placed in the range hood exhaust, meaning directly inside the ducting or conduit line that drives all the air outside. Placing them inside a cardboard box. This might not sound like much in theory, but when you put it in practice you will notice the difference. If you have the time for it, you can even build the blower a wooden and insulated box. You won’t even notice it’s there anymore. Remember one side of the box needs to always remain open. It’s best to look for tutorials online. Attach a speedster to your fan. It’s a speed controller, which will allow you not only to quiet it down, but also to be able to use a bigger one because of it. So instead of a 4in fan you could go with a 6in one, because the sound, which is now completely in your control via the speedster, will be much more toned down. Use a duct silencer. If you use it between the carbon filter and the fan itself you will indeed notice how the sound will reduce significantly. The silencers are lightweight, easy to use and have egg foam inner lining, which actually does all the noise reduction. Do inline fans use filters? Yes, they do and it’s usually a carbon one. Carbon is the number one choice because it is best at filtering out impurities from both air and water based environments. So you can get normal or hydroponic ones, for, let’s say, your pool or backyard pond. They are made of extruded granular activated charcoal carbon and they eliminate chlorine, sediment, volatile organic compounds, the taste out of water and odors from the air. The filters are normally attached to the inside of the extractor fan. What types of inline blowers are there? 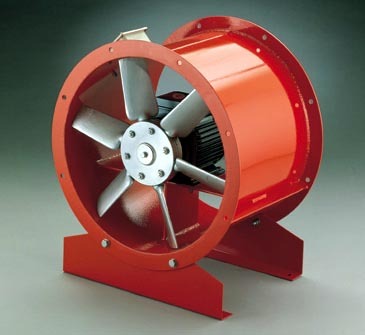 Axial and propeller fans – with the axial fans, the air flows parallel with the shaft. They are classified according to their wheel into C-wheel, which can be adjusted while the fan itself is running, they are small in dimension and have variable air volume; A-wheel, which can only be adjusted when the fan is standing still, small in dimension and adaptable as far as air volume goes; K-wheel, the blades are not adjustable at all. Centrifugal fans, also known as radial fans have the air flowing in a radial direction relative to the shaft. They too are classifiable according to their wheel, as follows: F-wheel, with the blades curved forward and changes in pressure that have little influence on the pressure head; B-wheel, with the blades curved backwards, they are highly efficient, consume very little energy and their sound emission is low; P-wheel, with the blades straight backward, they are self-cleaning and their changes in pressure have very little impact on the air volume and the T-wheel, with blades that are straight radial. It is self-cleaning also and it’s the best suited one for transportation. Combo flow fans, through which the air flows in both the axial and radial directions. The other difference is that they get a lot more pressure than the simple ones. Cross-flow fans, through which the air flows inwardly and then outwardly, in a radial direction. Ducted fans, which are used for aircrafts, such as planes and jets. They are electric in operation and have a higher thrust-to-weight ratio by design. Are fans influenced by external factors? Yes, they are. The biggest external factor that influences how inline blowers work is the air itself. The manufacturing conditions usually promise a certain delivery but, if the fan is working outside the Normal Temperature and Pressure conditions (NTP), it will not deliver the promised quality and you should have that in mind when operating it. Temperature and pressure vary because of the air’s density or because of location, meaning altitude or elevation above the sea level. Normal temperature and Pressure conditions mean 68°F, 9.92 inches Hg, 0.075 pounds per cubic foot. Equal speed and dimensions means that the volume of the flow will remain constant. Most people, when thinking of fans, they probably imagine those little white, round ones with three blades and one short leg, which you can put on the table to cool you down in the summer. And while that is completely true, there’s more to fans than that. Industrial, exhaust and inline blowers work magic around the house if you know where to place them. Here are some tips. In the bathroom – installing an exhaust fan in here, even a small one, will protect the bathroom not only from unpleasant odors, but from moisture as well. This means that the walls won’t “sweat” as much, the air will be dryer, the moisture left after hot baths will disappear much quicker and it will keep the paint on the walls from peeling. It will also keep doors from warping and it will stop mold accumulating on all surfaces of the bathroom. Using a fan in the drier room works in the same way. 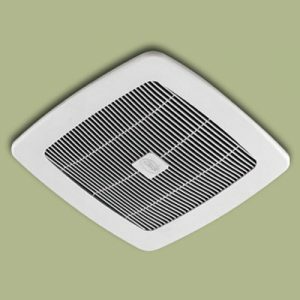 In the kitchen – as mentioned, these are exhaust fans as well, which help gather and release into the outdoors all the smoke, grease particles, fumes, vapors and bad smells that we usually associate with cooking. Kept active at all times, they can work miracles. Indoor swimming pool, greenhouse, sunroom – if you have one of these at home, you might want to think about installing an inline blower. It will help reduce the unwanted heat, keep the moisture and steam away and allow you to have perfect control over the temperatures in there at all times. Fans can also be installed into leaf blowers, as a duct booster fan to the machine’s capacity. Which are the best commercial fans? Vortex Fans – which offer fans, motors for DIY aficionados, accessories and all sorts of kits. While most fans are electric, some of their fans run on fuel. Some other brands are: Elicent, an Italian one, NuTone, which sell a great bathroom upgrade kit, Suncourt, Broan, HVAC Quick, Hydrofarm and Lowes. No matter what brand or type of fan you choose, make sure you install one in your bathroom or your kitchen. Clean and fresh air is very important and it’s never a matter than can be overlooked, especially in winter-time, when we make full use of our insulation and heat sources and keep our houses shut as tight as possible against the cold.